In 1779 the architect Victor Louis built Bordeaux’s Grand Theatre at the heart of the famous area of the Grands Hommes. This superb building is a reference-point in the discipline of architecture. In 1789, the architect signed another contract, facing the emblematic building: Mr. Sacriste de Rolly’s hotel at Place de la Comedie. This is how the InterContinental Bordeaux® – the Grand Hotel was born. The two buildings face one another with similar grandeur and aesthetically pleasing architectural characteristics such as: The Neo-classically inspired facade and Corinthian colonnade. These two buildings contribute to the irresistible perfection and charm of Place de la Comedie. In 1902, The Grand Hotel opened and grew quickly by expanding into neighbouring buildings. At the time, the hotel employed 100 workers and managed an immense wine cellar of approximately 30,000 bottles for its restaurant. Over the years, the Grand Hotel became a mythical destination travellers. In 1999, Michel Ohayon decided to purchase the eighteenth facade of the InterContinental Bordeaux – the Grand Hotel and the adjacent buildings, with the intention to revitalise the legendary Grand Hotel. In collaboration with the architect Michel Pétuaud-Létang, the project lasted 8 years. In 2007, the doors of the InterContinental® Bordeaux – the Grand Hotel opened revealing a world more majestic than ever before, orchestrated by the interior designer Jacques Garcia. From now on the hotel can be proud of its 5 stars. InterContinental® Bordeaux – Le Grand Hotel, is part of the prestigious Intercontinental Hotel Group, since December 14th 2015. Guy Bertaud is the managing director of the InterContinental Bordeaux® – Le Grand Hôtel. A tourism graduate and recipient of the prize for the best MBA thesis in Tourism, Guy Bertaud started his career at InterContinental Paris in 1992. After 25 years of experience in luxury hospitality, he is now looking to perpetuate the traditional French Art de Vivre while also providing the finest French gastronomy and service. The new face of Gastronomy in Bordeaux is the very famous Scottish Chef Gordon Ramsay. He is the chef of the two restaurants belonging to the hotel: Le Pressoir d’Argent Gordon Ramsay and Le Bordeaux Gordon Ramsay. Working with greats such as Albert Roux, Marco Pierre White, Guy Savoy and Joël Robuchon, Gordon Ramsay is one four English chefs that has three stars (Restaurant Gordon Ramsay). 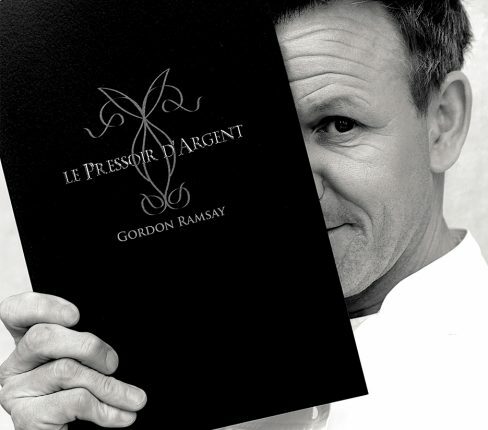 Gordon Ramsay signed the Pressoir d’Argent menu, extending his culinary art to the newly-labelled brasserie Le Bordeaux Gordon Ramsay, with Alex Thiebaut, as Chef de cuisine, who has worked with the Gordon Ramsay Group for many years, including 6 years at the maze restaurant in Mayfair, London. The designer of the hotel, Jacques Garcia, decorated the brasserie in several green-bottles, red Bordeaux and gold to give homage to the wines of Bordeaux and its emblematic location. It is called the “smart brasserie of Bordeaux” thanks to the association of the beautiful decoration of Jacques Garcia and the culinary passion of Gordon Ramsay. One can enjoy their Anglo-Saxon and French specialities, revisited with the talent and ingeniousness of Chef Ramsay. Respectful of the quality and freshness of local and regional products, the new menu of Le Bordeaux Gordon Ramsay proposes specialties of the South West of France with a British touch. Besides spending one night in the rooms of the splendid hotel, our winners of the Millésima Blog Awards 2017 will be able to dine at the brasserie Bordeaux Gordon Ramsay.